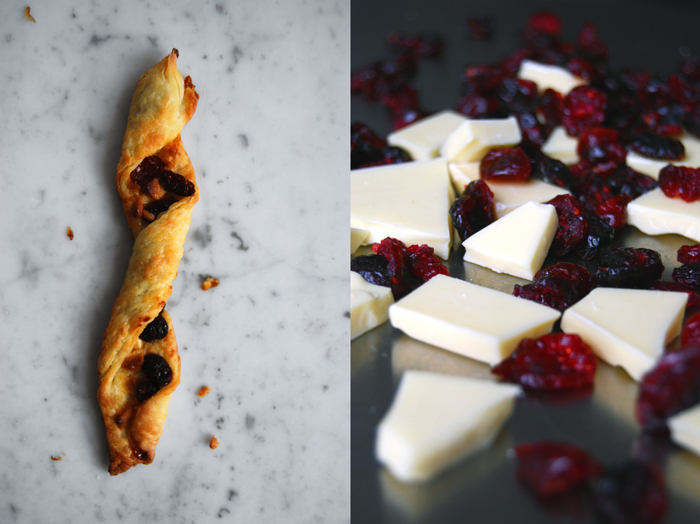 I’ve been wanting to bake something with white chocolate and cranberries since December but this idea never reached my oven – too much to bake, too little time. 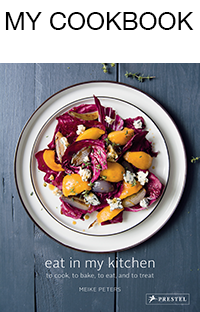 I was drawn to this combination last winter when I mixed them into my crunchy cookie recipe. The chocolate and the berries gave them a nice sweetness, milky and fruity. I enjoyed them so much that I decided to share them with our family and friends in Malta, so I sent them a big parcel stuffed with these cookies at Christmas time. The box was emptied within moments as we witnessed on Skype. This weekend I felt like this duo again but didn’t want to bake cookies. Croissants are more what I had in mind, just without the hassle of making two different doughs for the perfect puff pastry. 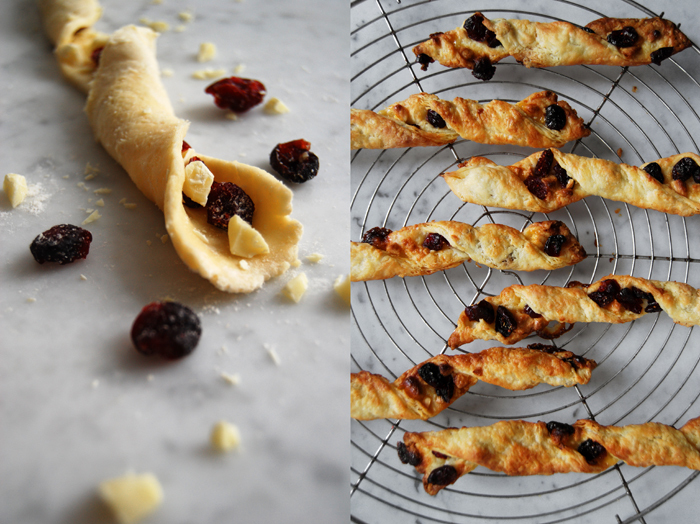 I thought of my buttery flaky Rugelach, this dough is made to be wrapped around a sweet filling but I wanted something bigger, not just a mouthful – a handful! 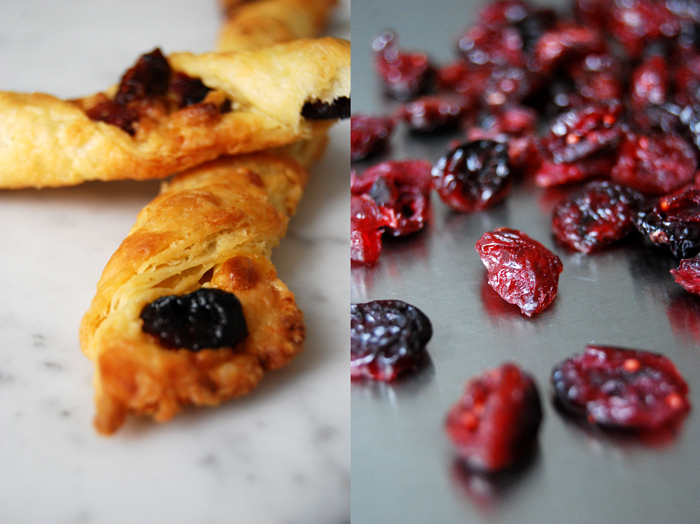 This is a Sunday morning pastry which you hold in your buttery fingers while you sip your coffee. I went for a long and twisted shape, quick to prepare, easy to eat, no hassle on a Sunday – Good morning everybody! 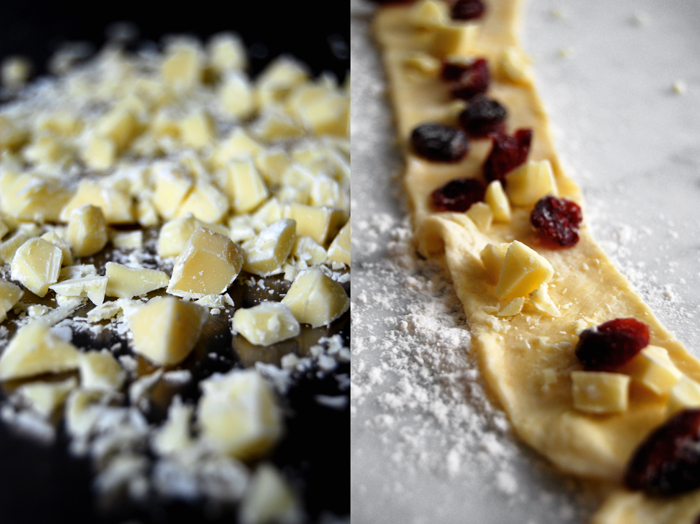 For the filling, mix the chocolate and cranberries. Combine the dry ingredients. Cut the butter with a knife into the flour mixture until there are just little pieces of butter left. Mix with your dough hooks for a few seconds. Add the cream cheese and work it into the mixture with a spoon or the mixer until you have a crumbly mixture. Form 2 discs and put them in the freezer for 30 minutes. The dough should be very cold but not too hard, still rollable. Preheat the oven to 185°C / 365°F and prepare a baking sheet with parchment paper. Take out one disc, leave the second one in the fridge while you’re preparing the first batch. Roll out the disc between floured cling film as the dough becomes very sticky at room temperature. Give it a rectangular shape, the width will be the length of your twists. Cut off a 4.5cm / 2″ strip and pull it off the foil (don’t worry if it’s sticky, it’s an elastic dough, you can also use a knife to lift it). Lay the pastry strip flat on your working surface, sprinkle with the filling, pushing it a little into the dough. Carefully, twist the pastry, starting on one side twisting it up to the middle and then continue from the other side. This way you don’t loose too much of the filling. Place the twist on the baking sheet and continue with the rest of the dough. Bake the pastry for 12 minutes or until puffy and golden brown. It’s best to check them after 10 minutes to be sure that they don’t get too dark. Let them cool on a wire rack for a few minutes. I love the combination of white chocolate and cranberry – the sweetness of the chocolate is so well balanced by the tart fruit. This is a lovely idea too and beautiful pictures. They make me feel very hungry! Thanks Kathryn! They really are a great match. I want to put them in a sweet bread soon, I’m really hooked on this combination!